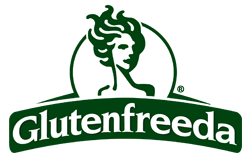 Glutenfreeda Foods has been an innovator in bringing new gluten-free products to market, from ice cream sandwiches to burritos. Their latest creation: pizza wraps. We recently sampled the three flavors from the company - Italian Sausage, Three Cheese and Pesto Chicken - and I can confidently say that these will be a staple in our freezer. They're filling and are make a quick and easy meal. Are these truly the gluten-free equivalent of Hot Pockets? In a word, yes. To prepare, we plated the pizza wrap in a wrapped paper towel and microwaved each side for 1 minute, 30 seconds. The wrap holds the contents together nicely, so a knife and fork are not necessary. Pizza sauce, mozzarella cheese and rice are common ingredients in all three flavors. 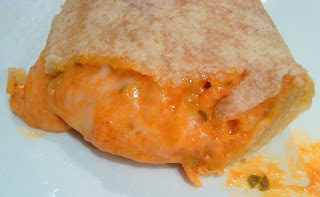 The Three Cheese also contains cheddar and ricotta. We liked all of them, though surprisingly the Pesto Chicken was the consensus favorite, followed by Three Cheese and Italian Sausage. My only quibble is that I'd prefer a rice or tapioca flour wrap over one made with corn. It's hard for me to think of anything other than Mexican food when eating a corn tortilla, especially one that has a trace of lime. The wraps are made with all-natural ingredients, have no hydrogenated oils or trans fats, and are made in a 100% gluten-free facility. Each wrap contains 4 grams of fiber per serving, with calories varying among the three from 220 to 240 and total fat ranging from 6 grams to 10 grams. Each package retails for between $3.39 and $3.59. The wraps are available at natural foods markets and online at Gluten-Free Mall. I love that you are a lawyer and put the disclaimer at the end...lol. You are perfect for this job! Thanks for doing it! Kerri R.